Beer Mutiny is a craft beer tasting event happening over 5 days in Mid June. It's more structured than a beer festival - you get 10 beers to taste from a selection, and this sounds like lots of fun, plus a great intro to lots of great British beers. "With the aim to actively contest negative perceptions about British beer, a new craft beer tasting festival, called Beer Mutiny, is being launched by The Craft Beer Social Club. The festival takes place from Wednesday 19th June – Sunday 23rd June in Shoreditch, London. 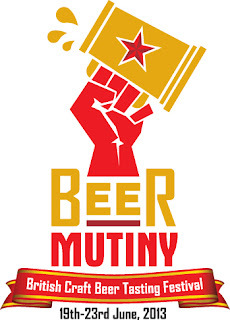 The idea behind Beer Mutiny (which has the motto: Go against the grain; stand up for British Beer) is to rebel against the common misconception that British beer is dull, uninviting and not readily available. The large number of mainstream beer brands, and lack of choice at the average pub, implies that the UK does not have a strong brewing tradition. However, the contrary is true: the number of breweries in the UK is rising (over 1000 at the last count) and they produce over 5,500 different beers on an annual basis. The Beer Mutiny festival will feature a different beer menu on each day of the event (over the five days there will be over 100 beers on offer) so even the most prolific beer enthusiast will find new British beers to try. Spaces are booked in time slots where attendees will first learn about the science behind how we taste before being able to choose ten beers from a choice of over 30 in that session. Tickets are £15 per person per session or £20 including snacks. Beer Mutiny will take place approximately every three months, and is part of a roster of events from The Craft Beer Social Club that help raise awareness about the wide selection of permanently brewed British beer. The events endeavour to educate the public on British beer history, the vast range of styles available, how we taste and score beer, as well as the provenance of beer."